George Sakellaris’ Richel/Pugh mini-maxi Shockwave crossed the finish line off Bermuda’s St. David’s Lighthouse Monday morning at 5:34 race time EDT (6:34AM local time). Her elapsed time was 63:04:11. Bella Mente, Hap Fauth’s 72 foot Judel/Vrolijk mini-maxi, followed by seven minutes with a time at 63:11:25. The two boats had battled head to head within sight of each almost continuously for over 635 miles. Caol Ila R, Alex Schaerer’s 68 foot Mills IRC racer, crossed third at 8:33 local time, three hours behind Shockwave at 66:03:52. Based on preliminary ORR results, Shockwave stands first on corrected time in the Gibbs Hill Lighthouse Division, Bella Mente is second and Caol Ila R is third. The next boat on the course, the US Naval Academy TP52Constellation, is expected to finish more than 16 hours after the leader on Monday night. The remainder of the fleet is caught in the fickle winds of a frontal zone, waiting for the system to drift east-southeast and weaken. The picture is not pretty for boats still on the course. Light conditions will prevail through Wednesdayand maybe longer. 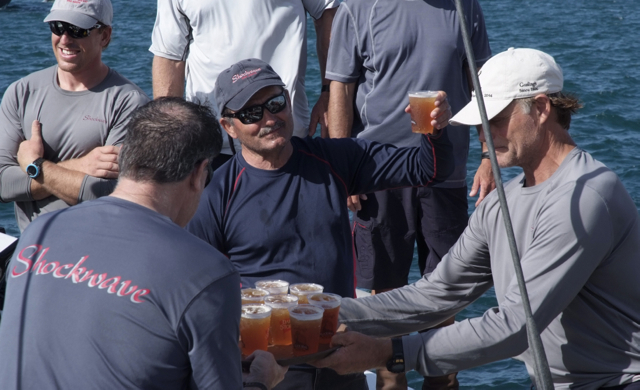 Robbie Doyle sailed his 12th Newport Bermuda Race as the “stratitician” on board Shockwave. “We got a knot and a half out of it. The stream came around (motioning to indicate a southwest to northeast direction to southeast direction) and what happened is that this part (flow) stopped and decided it was going to reconnect itself eventually and just become a smooth stream. We got through it,” he added. 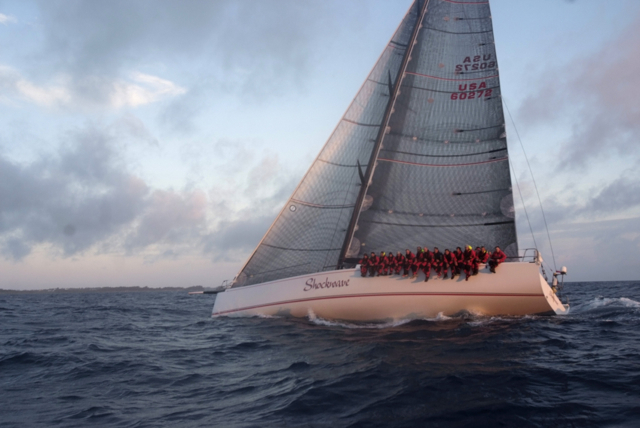 The win adds to Shockwave’s growing list of recent victories, highlighted by their division win in the 2012 Newport-Bermuda Race, the 2013 Montego Bay, and the 2014 RORC Caribbean 600 Race. Originally launched in 2008 as Alpha Romero 3, Shockwavecontinues her winning ways.